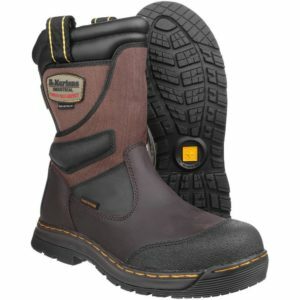 Looking to find your best rigger boots? Their name comes from the fact that they were standard issue for workers on the offshore oil rigs in the North Sea, but are nowadays worn by most types of manual workers as a general purpose work boot with steel or composite toe cap. Whether you plan to use the rigger boots on construction sites, farming or to simply walk your dogs during the winter cold, besides providing you with the right level of comfort there are a few key factors that you should take into consideration before buying a pair. You can read our Buyers Guide at the end of these reviews. What are the best rigger boots? 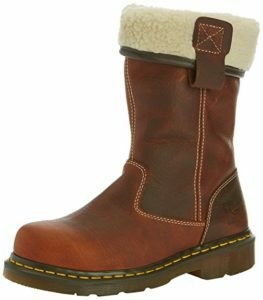 We created this list in which we included the most popular and best-rated rigger boots for men and women that you can currently buy online in the UK. All that’s left is for you to choose the one that fits your needs and budget. So read through our rigger boots reviews and decide which one is the best boot for you. I have to admit: these B-Click rigger safety boots do look great. Made of a high-quality soft leather, you get that expensive look for a very reasonably price. They are equipped with a steel toe cap that protects you against heavy objects that might fall on your feet. Being anti-static and with a shock absorbing heel and steel midsole protection, they tick all the right boxes in terms of style, comfort and safety. These safety rigger boots also offer a great anti-slip protection thanks to their rubber sole. They are resistant against acids, alkali and oil. They also benefit from a water-resistant feature, which means your feet stay dry throughout the wet, rainy days. I couldn’t find anything that I don’t like about these besides the ‘Traders’ logo on the side of it, my personal opinion is that its colour doesn’t necessarily go with their dark brown design. I’m being a bit fussy again, right? Overall, great value for money and with a 5 stars review – they are currently one the best-rated rigger boots on Amazon.co.uk. These brown Amblers rigger boots are great if you’re looking for a stylish, yet sturdy pair of boots. Made of leather, they are equipped with a composite toe cap and midsole protection. Therefore, you get that extra piece of mind that your feet won’t get hurt by any sharp objects that surround you. Thanks to their slip-resistant sole, they are quite flexible in terms of working environments, whether you plan to use them in farming, construction or any other industrial environment. 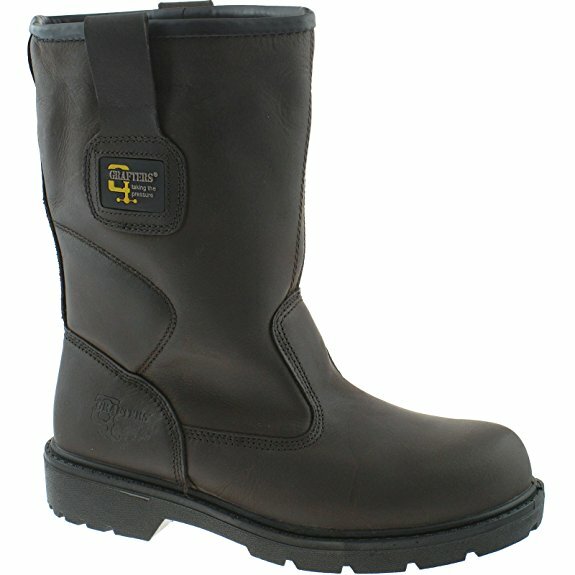 Plus, these waterproof rigger boots guarantee to keep your feet dry and warm during rainy days. Another good looking, long-lasting pair of boots but they don’t come cheap. So do take your budget into consideration before thinking about buying a pair of these. These leather Jallate steel toe capped rigger boots are oil and water repellent. They are equipped with a comfortable footbed and a shock absorbing heel. I was surprised of their breathability feature, considering their tough, sturdy composition. Besides their steel toe cap, they are also equipped with a steel mid-sole protection. They are anti-bacterial treated, which reduces the risk of fungi or bacteria. You get a good grip thanks to their rubber sole, which is a great and much-needed feature for a pair of rigger boots. Safety is their main priority but comfort hasn’t been neglected either. They tend to stay comfortable throughout the whole working day. You could easily use them in heavy-duty environments as they are very hard-wearing and offers you the right level of protection. Plus, you’d expect them to be heavy but – that’s not the case. They feel quite lightweight for a pair of rigger boots with steel toe cap. Yet again, they don’t come cheap. However, they are a great choice as a pair of fully waterproof and comfortable rigger boots and will keep your feet safe in some of the most dangerous working environments. Another great leather pair by a leader in this industry, Dr Martens. They have been selling safety boots in the UK for quite some time now and are one of the best-rated brands in terms of safety, comfort and durability. Fully waterproof and thanks to their composite toe cap, you do get the protection you need. They feature an anti-slip protection thanks to their rubber sole. With antistatic properties and a praised comfort, these Dr Martens rigger boots are made to last. That’s one of the reasons they are one of the most expensive rigger boots of our list but most of the time you do get what you pay for. Well made, sturdy, yet not as heavy as you might expect. They should last you for years, so if you don’t mind paying that little extra, you should definitely take a look. TheseDr Martens womens rigger boots can easily replace your wellies thanks to their practicability. Stylish, trendy and good looking so be ready to get compliments in regards to that. After all, who doesn’t love a compliment? These rigger boots for ladies are easy to get on and off, even for a wide foot. Plus, they have a steel toe cap that promise to keep your toes safe from heavy or sharp objects. They are great to wear in the winter cold, you can rest assured they will keep your feet warm and dry. Besides that, their sole offers a great anti-slip protection thanks to its thick rubber treads. What I don’t like about them: if you have a wide foot, you might find yourself in the need to order one size up. However, a free return policy is in place to make sure you get what you need. 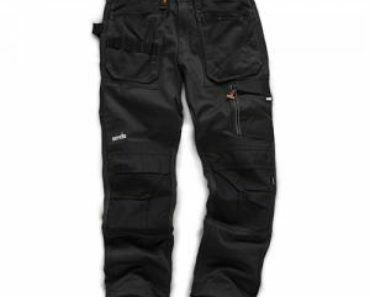 Overall, good value and, as a bonus, they look great (folded down or unfolded as a longer boot) for everyday wear regardless of practicability. These Blackrock fur lined rigger boots are great if you find yourself on a budget. 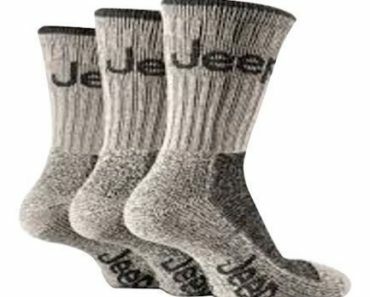 They will keep your feet warm during the winter cold. 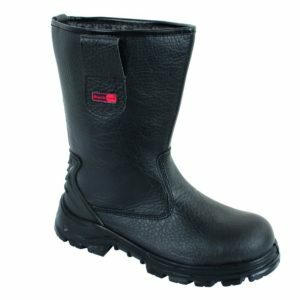 Made of a strong leather, these black rigger boots for mens are fully waterproof. Keeping your feet safe is one of their top priorities, therefore you’ll find a steel toe cap and a steel midsole protection. thanks to their removable insoles you can look online for best insole for work boots alternatives. I wouldn’t necessarily recommend them for construction work, I think they are a better choice for lighter work – like gardening, etc. They won’t last you as long as other, more expensive pairs, but they are a very popular choice amongst others as a cheap rigger boot. These Grafters rigger boots have a padded ankle for extra support, which increases their overall comfort. They come in a dark brown blend that gives them a very smart look. Equipped with a steel toe cap and steel midsole, you get the protection you need. These Grafters rigger boots with ankle support are made of a soft, yet waterproof leather. Probably, the only thing that lets them down is the quality and purpose of their sole. Its anti-slip feature doesn’t seem to be very effective in certain wet, greasy environments. Besides that, good value for money and a well-deserved spot in our list. If you consider all the challenges of your job or specific needs, the rest of the characteristics will fall into place, and you will be lucky enough to say you have indeed found the holy grail of rigger boots. Rigger boots need to be extremely resistant to slips, which is why you have to consider the outsole material. I like rubber and Vibram, but make sure the boots have at least the minimum safety protection rating SB, which protects you against slipping on oil. 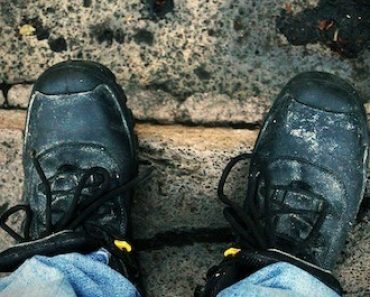 However, if you’re working in a tougher line of work, you should consider an outsole that can also protect you against chemicals, while marking and debris are real challenges on uneven terrain. If you’re working in a place with electrical hazards, you should make sure your outsole keeps your feet protected from heat as well as static electricity. While the outsole is the indicator of grip, the midsole may very well be the indicator of comfort. That’s because a good midsole can offer you increased support, which is especially important if you’re spending your whole work day standing. 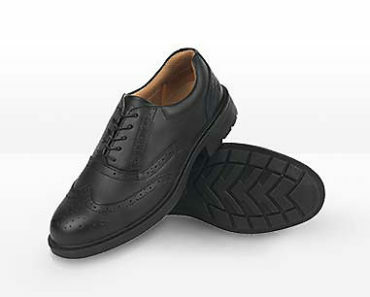 Steel midsoles are also very resistant to punctures, which might be important for your job. In that regard, I like midsoles that have an ergonomic design. Anatomically-correct rigger boots will feel more comfortable and more supportive, getting rid of all sorts of aches and pains, including back pain or even the heel pain caused by your plantar fasciitis. 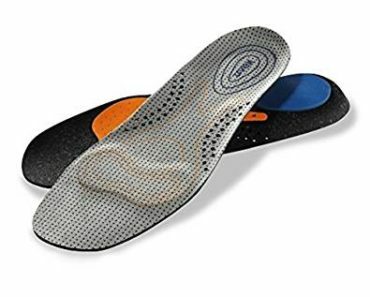 An insole needs to be cushiony, anatomically-correct but also insulating, not to mention breathable and moisture-wicking. That’s quite a lot of responsibilities, right? But you can choose a good insole depending on where you’re working, or you can remove your insole altogether and add one of your own. You might need a cushioned insole if you’re on your feet all day, and also if you’re working in a colder environment. Otherwise, a thicker pair of socks might do the trick just as well. At this point, the best exterior material for your rigger boots’ uppers is leather. But there are many types of leather, and while full-grain is more-resistant against punctures and water, it’s also more predisposed to scuffs. On the other hand, suede can take scuffs better. You should pick the interior material according to your line of work too. Fur-lined rigger boots are warmer and softer, but fur might wear out faster. Conversely, a textile interior might solve these problems, it might wick moisture better to save you from sweaty feet, but it’s not as breathable as fur. 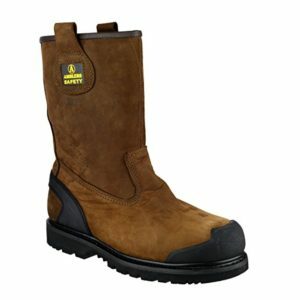 Rigger boots are pull-on boots by definition, but there are different pull-on mechanisms on the market. Some loops are stitched, while others feature a metal pin. Some loops go past the upper like rabbit ears, while others sit under it. And still some loops are positioned entirely on the outside on the boots, while other loops are fixed with one of their ends inside the boot, and one outside the boot. So which are better? The most resistant loops are the ones that are stitched all around their ends; if one stitch breaks, you might be able to replace it. But if the whole metal pin rips, you’re pretty much left with a useless boot. And if resistance is your top priority, loops with one end on the inside and one on the outside are also more durable. If the stitching comes undone on one side when you’re at work, you at least have the other side that’s functional to fall back to. I also like longer loops because they’re easier to use when you’re putting on your boots. However, they might prove inconvenient if you work in a cramped environment and have plenty of stuff to hook your boots to. Most rigger boots feature steel toes, but some come with composite or alloy toes, while others don’t have toe reinforcements at all. When you’re making the choice, the first thing you need to take into account is that the boots meet the safety requirements from your workplace. The difference between these is how resistant they are to all sorts of hazards. 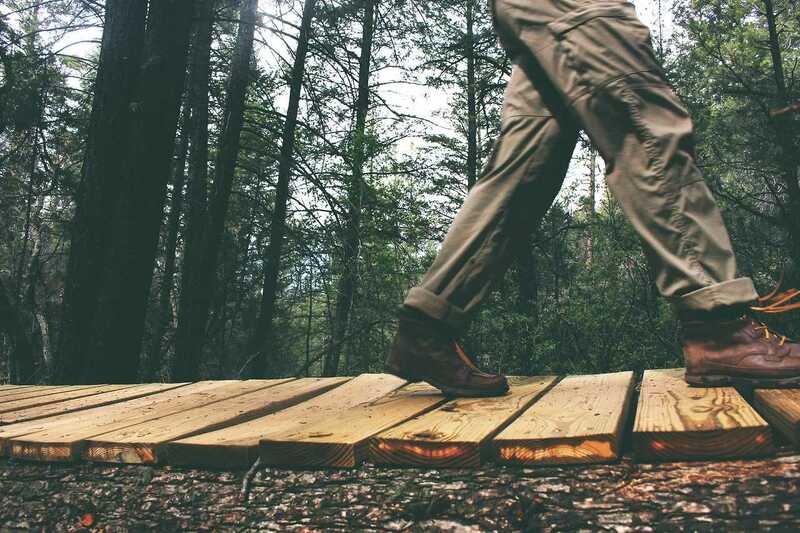 Steel toes are the most resistant to impacts, compressions, and cuts, and they can face electrical hazards if they have the proper protection, but they’re the narrowest and heaviest. An equally good protection against impacts, compressions, and cuts can be offered by alloy-toe boots, and these are also lighter. If you’re working in a place with fewer such hazards but lots of electrical hazards, you can always choose composite toes, which feature a comfortable toe box. The soft-toe boots are the most comfortable, but these might not be accepted at your workplace because they don’t meet any safety standards. And not to look the gift horse in the mouth or anything, but you can also check how ergonomically positioned these toe reinforcements are. Asymmetric toes are the best from that perspective because they respect the anatomic shape of your feet. Get resistant stitching, that’s really important if you want to get a durable pair of rigger boots. While a Goodyear Welt is the most resistant from the batch, and you can repair it easily, you can also choose a different sort of stitching if you don’t work in a very rugged environment. Just make sure you consider the stitching on your pull-on loops too when you’re making the choice. Another thing to think of is that you want your stitching resistant to most of the same things as your boots are. So if you want waterproof boots, make sure the stitching is waterproof too. Likewise, it would be great to get heat-resistant stitches if you’re working with electrical hazards. 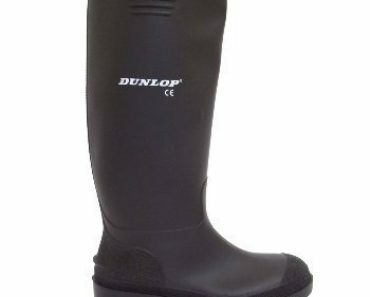 Speaking of waterproof rigger boots, you might only want these if you’re working in a place filled with puddles or prone to heavy rains. 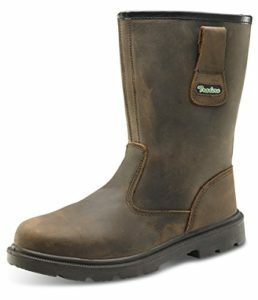 Otherwise, if you’re working indoors or if you only have to face shallow rains, you can go with a regular pair of rigger boots that are simply resistant to water, so not entirely waterproof. But if you want waterproof rigger boots, take into account that full-grain is better than other types of leather. You can also waterproof suede boots, but this material needs to be waterproofed more frequently than full-grain leather. You don’t need to spend a ridiculous amount of money to get the best rigger boots for you, the key phrase being for you. There are plenty of cheap rigger boots out there that do an ok job but make sure you choose a trustworthy brand that manufactures quality footwear. Regardless of the budget, it’s more important to read plenty of rigger boots reviews before making your purchase. After that, you can decide if it’s wise to wait a while and invest in a more high-end pair of boots, or if a cheaper or mid-range pair can perform well enough in your line of work. It’s always better to choose something based on its functionality, and not how many bling-bling-useless-but-costly qualities it has. Whether you are looking for a pair of boots with steel toe cap or composite cap, we’ve got you covered. We included some of the most popular and best-rated rigger boots for mens and womens that you can buy online. Always keep in mind your working environment and the overall conditions. It is important to know where you’ll be using them before choosing your best rigger boots. I hope these rigger boots reviews will make your choice easier. If you would like us to add a particular pair to this list, please let us know in the comments box below. Until then, stay safe while feeling comfortable!